Fish is seafood which is recommended to be included in the daily diet. In fact, according to the American Heart Association (AHA), eating fish twice a week can reduce the risk of stroke. The AHA also recommends consuming 3.5 grams of fish that is not fried every portion. However, among the many types, there are some of the healthiest fish to consume. All types of salmon contain omega 3 fatty acids that are beneficial for heart health. Besides omega 3 fatty acids, salmon is also a good source of vitamin D and calcium to support bone health. Salmon also contains selenium which helps support the body's metabolism. 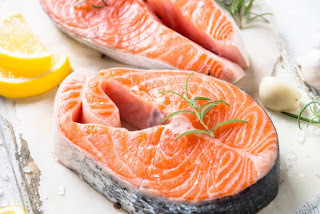 Not only that, the content of vitamin B12 found in salmon is also very good for the health of your brain and body. However, wildly caught salmon turns out to be far healthier compared to cultivated salmon. Free-released salmon in the ocean contains more omega 3, vitamins, and contains less saturated fat. Sardines include oily fish that are rich in nutrients. In sardines it contains calcium, iron, selenium, protein, vitamin B12, and omega 3 fatty acids. In addition, sardines are also a good source of calcium and vitamin D alternatives for those of you who have milk allergies or lactose intolerance. Even though it is healthier if consumed in fresh form, you are definitely more familiar with canned sardines in the supermarket. Before buying canned sardines, you should read the packaging label carefully. Make sure the extra oil content and sodium are not too excessive. Tuna is one of the fish that is rich in protein, omega 3 fatty acids, and selenium. Tuna contains selenium minerals in the form of selenoneine. This form of selenium plays an important role in health, namely antioxidants and protects red blood cells from free radical damage. In addition, selenium is also found to be able to bind mercury compounds in the body of the fish thereby reducing the danger if consumed by humans. Not all tuna contain high mercury. However, still pregnant women, nursing mothers, babies and children tend to be more susceptible to mercury which can damage the development of the nervous system. Therefore, the portion needs to be limited, which is around two servings of fish per week. Choose canned tuna because it has less mercury than fresh or frozen tuna. In addition, compared to albacore white tuna, choose light canned tuna because it contains less mercury. 0 Response to "3 Types of Fish are the Healthiest to Eaten "